If automotive companies are excluded, the top 10 is dominated by fuel cell companies such as Plug Power, Ballard and UTC, and is rounded out by Canon and GE. 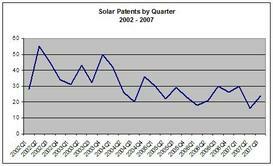 Top patent owners in the Solar energy area include Canon, Sharp, Boeing, and Kanegafuchi Chemical Industries. Aloys Wobben of Enercon GmbH tops the wind list followed by GE while Honda, GM, Ballard, United Technologies, and Plug Power lead in fuel cells. 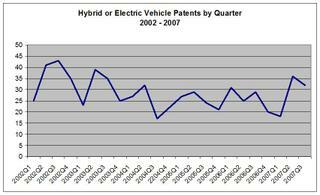 Hybrid/electric vehicles are dominated by Honda and Ford with Toyota, GM and Nissan trailing. Geographically, U.S. patent owners and inventors tie the rest of the world in the number of US patents in the Clean Energy field over the period 2002-2007 with fifty percent of the granted U.S. patents. Patent applicants from Japan (29 percent) and Germany (8 percent) were issued the second and third largest number of U.S. patents. The U.S. states with the largest number of U.S. patent owners and inventors were Michigan (13 percent), California (7 percent), New York (6 percent) and Connecticut (4 percent). The U.S. (46 percent), Germany (20 percent), Denmark (8 percent) and Japan (6 percent) were tops in the world in wind with New York (13 percent), California (9 percent) and Texas (3 percent) leading the U.S. The U.S. (44 percent), Japan (35 percent) and Germany (6 percent) lead in Solar energy patents over the period from 2002-2007. California (14 percent) leads the U.S. in Solar energy patents followed by a second tier of Illinois (4 percent) New York(3 percent), Massachusetts (3 percent) and New Jersey (2 percent). 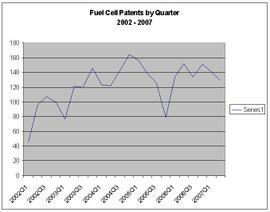 The U.S. (53 percent), Japan (28 percent) and Germany (8 percent) again were the top patent grantees in Fuel Cell technology while Michigan with 15 percent dominated the U.S. rankings followed by New York and Connecticut with 7 percent and California with 5 percent of the total patents granted to U.S. patentees. 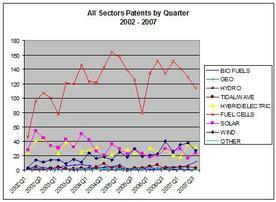 Although not depicted, Biomass/Biofuel patents were distributed over ninety one owners for the five year period from 2002-2007 with the Research Foundation of the State of New York having the most granted patents at five followed by Manufacturing and Technology Conversion International, Inc. at three. 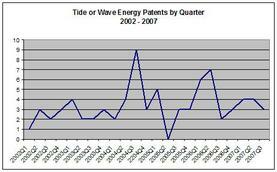 Ocean Power Technologies, Inc. had the most patents (8) in the tidal/wave energy technology area. 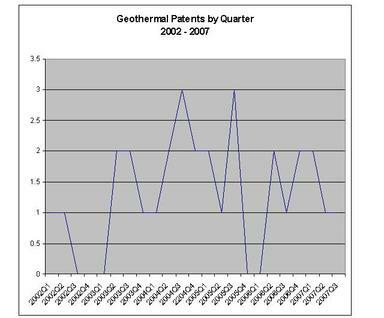 Kalex, LLC had the largest number of geothermal patents at eight. Herbert L. Williams had three patents in the hydroelectric area while the following had two: Aloys Wobben, Kabushiki Kaisha Sankyo Seiki Seisakusho, New World Generation Inc., and Hydro Resource Solution LLC. © 2008 Heslin Rothenberg Farley & Mesiti P.C. The term GREEN suddenly seems to be everywhere, and yet a precise definition of what constitutes a GREEN product or service is not easily found. In the 1970s, political groups used GREEN primarily as a symbol of environmental protection and social justice, i.e. the “Green Movement.” Today, the meaning of GREEN is expanding and used in connection with a variety of products and services in the marketplace. 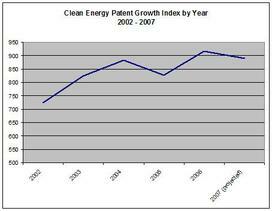 The Clean Energy Patent Growth Index (CEPGI) of Heslin Rothenberg Farley & Mesiti P.C. 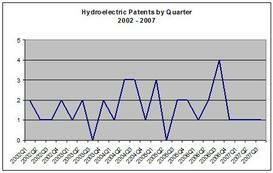 tracks the granting of patents by the United States Patent and Trademark (USPTO) in the clean energy sector. 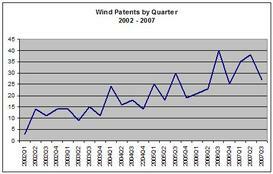 As of the third quarter of 2007, the CEPGI indicated a generally upward trend in clean technology patents over the last five years. In another area of intellectual property, the growth of GREEN trademarks can provide us with further insight into the cleantech marketplace. “Green Energy” is considered energy that is renewable, more efficient or environmentally friendly. “Green Power” is electricity supplied in whole or in part from renewable energy sources, such as wind and solar power, geothermal, hydropower, and various forms of biomass. In the U.S., however, there currently are no agreed-upon industry standards or restrictions regarding what GREEN actually means in connection with energy and energy technologies. Unlike the word ORGANIC, which has been regulated by the National Organic Standards Board since 2002, there are no guidelines regarding who can claim to be GREEN. However, there is a general idea in the marketplace regarding what GREEN should mean, and its use is surely indicative of current trends in the economy. A trademark search on the USPTO website for trademark applications filed, by year, that incorporate GREEN in connection with energy related goods/services is telling. These filings were compared with a search for CLEAN and RENEWABLE in connection with similar goods/services. 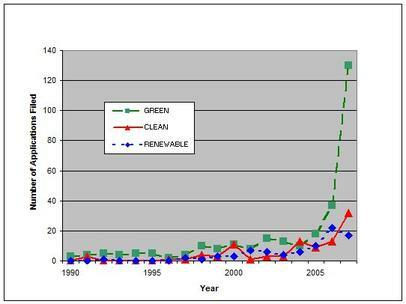 As seen below, while trademark applications for CLEAN and RENEWABLE slightly increased over the past five years, a distinct spike was seen in applications incorporating GREEN. Specifically, GREEN applications were 3.5 times greater in 2007 than in 2006, and increased ten fold since 2004. The total number of applications since 1990 incorporating GREEN in connection with energy related goods/services exceeds the combined filings for CLEAN and RENEWABLE. Whether the substantial spike in the occurrence of GREEN as a trademark can manage to sustain itself in the marketplace remains to be seen. However, if it is any indication, USPTO trademark filings that include ORGANIC have yet to slow down despite the newly imposed standards. Although not as sophisticated as the CEPGI, the above analysis furthers the conclusion that, in the face of an increasing concern over energy costs, resource shortages, and global environmental concerns, not only are technological innovations occurring in the clean technology sector, but financial investments, business ventures, and marketing efforts are being made as well. The CLEAN ENERGY PATENT GROWTH INDEX (CEPGI) is published quarterly by the Cleantech Group at Heslin Rothenberg Farley & Mesiti P.C. The CEPGI provides a relative indication of the effort (e.g., Research & Development) put into, and success of, Clean Energy innovation. The granting of patents by the United States Patent and Trademark (PTO) is an often cited measure of the outcome of inventive activity and the resources invested in developing innovations, such as research & development funding. The successful granting of a patent requires that efforts be made by inventors to develop innovations and by patent counsel to shepherd a patent application through the PTO. A patent thus is an indicator that efforts at innovation have been successful and that an innovation had enough perceived value to justify the time and expense in procuring the patent. 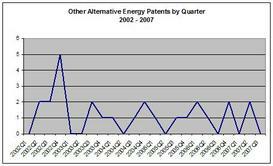 As indicated in the quarterly composite graph of the CEPGI components depicted below, fuel cell innovations provide the largest absolute number of clean energy patents and drive the CEPGI trends to a degree. Solar and wind energy along with hybrid/electric vehicles provide the other significant part of the CEPGI with the remaining components contributing to a lesser degree. Wind energy innovation is on an upward trend while solar energy innovation appears to be heading in the opposite direction. The patents included in the CEPGI and its sub-components have been vetted by the Cleantech Group at Heslin Rothenberg Farley & Mesiti P.C. to ensure that each patent is properly included in the appropriate sub-component and that the technology disclosed therein relates to the generation of energy for consumption by a device other than itself. Coming soon…Clean Energy Patent Assignee and geographic information.